SINGAPORE - A publicity stunt for the upcoming Call of Duty: Black Ops III first person shooting has come under fire, after its official Twitter account started spreading fake news about a terrorist attack in Singapore. At about 1am on Tuesday morning, the official Call of Duty account (@CallOfDuty) changed its name to "Current Events Agg." and started sending out tweets, and live reporting about an attack. The first tweet, which said, "BREAKING NEWS: Unconfirmed reports are coming in of an explosion on the North bank of the Singapore Marina. ", was sent to its 2.9 million followers. It was followed by several photos of a city in destruction, followed by descriptions of the explosion site, as well as updates about the situation, including this one: "UPDATE: Singapore Authorities have officially announced a state of emergency and declared martial law". Video games new sites such as Polygon and IGN have called the stunt "tacky" and "irresponsible", while netizens around the world have lambasted game publisher Activision for the move. Twitter user "Cowboys 15-1" said: "Have some respect for Singapore, such a shame." Another user, "Av8orGamer" added: "This method of advertising is actually kinda sick. I know people in Singapore." Others questioned the incorrect details within the fake tweets. 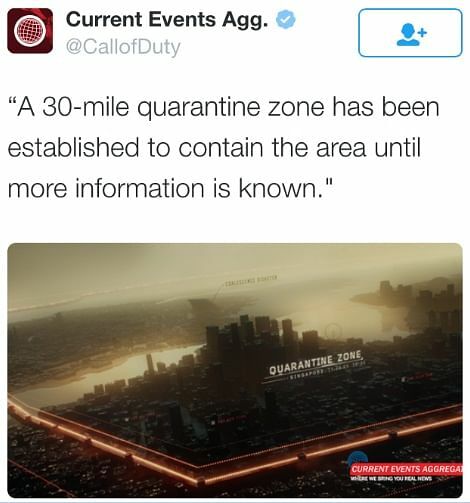 In response to an update that a 30-mile quarantine zone had been established, Twitter user "longadin" responded: "Errr? Singapore's just 31 miles wide. A 30-mile zone????" The account tweeted about 20 times over the next five hours, with the final tweet reading "This was a glimpse into the future fiction of #BlackOps3.". The account has since gone back to its original Call of Duty name, but the fake tweets have not been removed. Call of Duty: Black Ops III is slated to be released on November 6. The opening level of the game is set in Singapore in the year 2065. Players are supposed to investigate a United States Central Intelligence Agency site here, which has mysteriously gone off the grid.